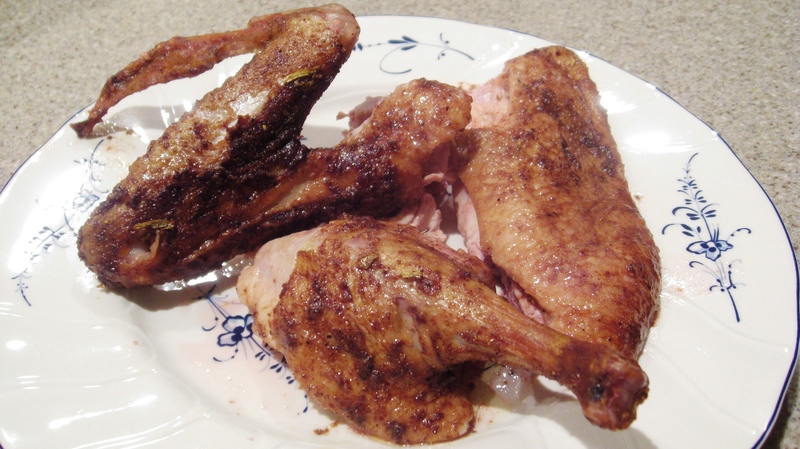 We love cooking whole chickens, hens, and of course ducks! 🙂 So what better way than to start the New Year than with a juicy, crispy, spicy whole duck. You also know that we like spices – this recipe calls for a savory Indian spice rub. Before we share how we prepared it, we’d like to point out that this $18 duck, will feed 2 hungry Svendblads, and will give you the opportunity to make a whole big pot of duck soup after you’re done munching on the tenders. Watch for our duck soup recipe shortly. It should feed 4 hungry adults. Yumm! If you like this dish, also check out our Tamarind Duck Breast. Super delicious! Pr-eheat “convection” oven to 375 degrees. Depending on your oven you could potentially turn it to 385 degrees, just as long as your meat thermometer reads 170 when done – you’re good to go. Ours cooked for about 55 mins on 375. Boil 2 cups or so of water. Now let’s prep your duck. Make sure to thoroughly wash your duck and pat it dry. Set neck and innards aside. Get your roasting pan ready place your duck inside and slowly pour the boiling hot water over the duck, turn and pour the rest over the other side of the duck. The skin will contract, which will ensure that the skin gets nice and crispy. Pour all water out and pat duck completely dry. Melt Ghee and stir in all spices and brush onto entire duck and begin to roast breast up. Do not discard carcass, neck or innards – save for soup. We’ll post soup recipe shortly. We hope that you like this as much as we did; we served our with some asparagus, but you can choose any of our side dishes or your own favorites. WOW…. This looks really good. I just want to let you know I’m “available” this weekend if you are making it again – perhaps on Saturday night you are making it again? Perhaps, it will be accompanied by my favorite banana choc chip coconut muffins? Love you guys! XOX – Would love a recipe soon with ground lamb and eggplant and lots of aromatic spices. Hi Janini! I will definitely share the aromatic veggie recipe, it’s MDA’s modified eggplant one. I have business dinner guests on Saturday, but perhaps lamb on Friday? Let me check with Henry! Love you and Happy New Year!